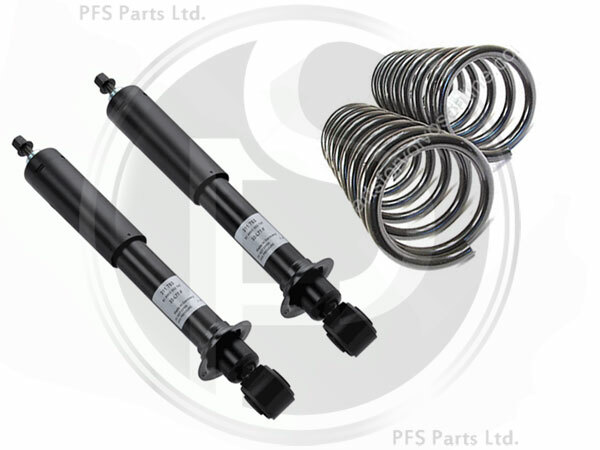 This kit enables you to change from the expensive self levelling shocks (Nivomat) to standard shock absorbers and springs for less than the cost of replacing one nivomat shock! 2 x Standard Sachs/Boge rear shock absorbers. 2 x Standard type rear coil springs. When you remove the Niovmat self levelling dampers, the rear suspension will just be compressed down when under load like any other car. If you are considering making this conversion to remove the Nivomat function or not, we recommend that you choose the best option (replace with like for like expensive genuine parts or to remove the nivomat using our kit) based on your type of use of the car . but if you regularly tow with the car for example and or frequently have a full load it would be advantageous to replace with new nivomat dampers (if your budget allows) but you may of course install our kit still. When fully loaded the rear suspension will be compressed down a bit just like any other car. It needs to be taken into account that Nivomat self levelling is fitted as standard by Volvo on all XC90 models sold in the UK as it is extremely good to have as it keeps the rear of the car level under load for example when towing but unfortunately cost prohibitive when it comes to the time it needs replacing. Making this conversion will not result in any direct issues, as models sold outside of Europe in markets such as the USA only had Nivomat available as an extra cost option, so the majority of cars there do not have Nivomat, and hence we know it is ok to convert your car back to standard suspension.